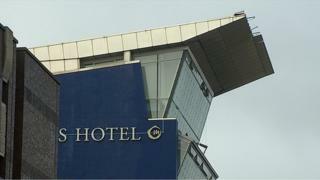 Two roads have been closed in Glasgow city centre after roofing from a hotel was blown off amid ongoing stormy weather conditions. The roofing came from Marks Hotel in Bath Street. Police said Hope Street was closed between West Regent Street and Sauchiehall Street and Bath Street was closed between Renfield Street and West Campbell Street. Building control officers from Glasgow City Council were at the scene. Police said local diversions were in place.